Fabric Mart Fabricistas: Planning for 2014... Your Feedback Please! 2014 for is just around the corner and we are gearing up for the new year! With a new year comes new ideas, projects and a lot of fun! We'd like some feedback from our customers. What do you want to see on our blog? Do you have a specific topic you would like us to talk about? Do you have a pattern that you would like us to review? Would you like to contribute to our blog? 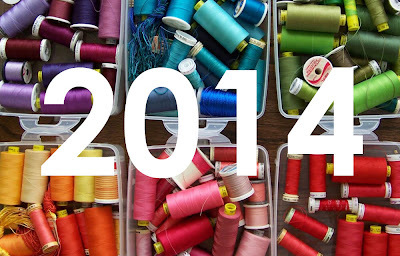 How can we inspire and offer advice to the sewing community? We have some ideas up our sleeves but would love to hear from you! Leave a comment with your ideas and we will take them into consideration. If you would like to contribute to the blog, please email fabricmartblog[at]gmail[dot]com with your ideas. Are you going to do the fabric challenge again? I adoooooooored seeing all of the entries. I was thinking of trying to figure out how to throw my own hat into the ring. I'd love to see discussion of some of the more unique fabrics you have on your site. I come across some really cool looking things but I'm not familiar enough with them to feel confident in ordering. I should just go ahead and do it though. I've never been unhappy with anything I've ordered even if it wasn't quite what I expected. We haven't made a decision to do the Fashion Challenge again, but it was a lot of fun! We are taking it or another type of contest into consideration for 2014. What unique fabrics would you like to learn more about? Post a couple of links from our website too, that will help us get a better idea of what you are interested in learning more about. I don't know if fabric requests are acceptable, but I would love to see your store get some brightly colored wool flannel fabrics in stock that are appropriate for making skirts. I love the brightly colored double serge wool J Crew pencil skirts that they have sold in neon colors, but I cannot find any brightly colored wool flannel fabric anywhere. Fabric requests are always acceptable! If we can find it and get it at a reasonable price, we may just buy it! Thank you for your feedback! I would love to write a blog! I have been sewing since I was five, and now that I am (ahem) "over sixty" I am most interested in the latest styles that may have to modified and fitted for older women. Since I am still working my sewing is around clothes that can do double duty. I love the new knits, and your selection is always good, would like to see more ponte. It could be fun to read about a different specific fabric each month. Maybe a "fabric in focus"-type feature with suggestions on how to care for/work with that fabric, a few pattern suggestions for how to put it to use, a special sale price, ability for people to link back later or submit a photo after they sewed up something from that fabric. Thanks for the idea! I will put that on the list of items to take into consideration. I like carihomemaker's suggestion for a "fabric in focus" feature. My suggestion also was going to be that you supply a few pattern suggestions for specific fabrics. It would be very helpful in deciding if a fabric will work for the garment I am planning to make and may inspire me to make something I hadn't thought of. I love your website. I have been very pleased with everything I have ordered and always impressed with the quick delivery. Your sales and bundles are great! The bundles are so much fun, like a box of chocolates, you never know what you're going to get! I would like to learn more about picking the best fabric for a pattern: stretch, drape, weight, etc. it would be fun to see patterns sewn up with fabric that is a good match and with fabric that doesn't work as well. I'd really like to see a section on fashion fabrics that don't require ironing. I love quilting, but let's face it 100% cotton does not play well in clothing. I like the "fabric in focus" idea. Another fashion challenge would be fun. Please keep Julie posting.I especially liked her tutorial on sewing with mesh fabric. Also, I appreciate sewing room organization ideas similar to Shanni's post. Thank you for asking for our input. Thanks for all the ideas!! I'm definitely going to be taking these into consideration. Keep the ideas coming!! I would love to see garment pattern reviews done comparing the same pattern done in multiple fabrics, so you can see the real potential of a patten. I also think a review like that would be more objective, and honest.